Located off the coastline of Gujarat, the city of Dahej is known for its bustling trade and commerce. Strategically situated at a convenient distance of about 12 km from the highway to Bharuch, Regenta Central Hestia, Dahej is the suitable destination for transient and long stay travelers. This hotel in Dahej is situated in the vicinity of the major industrial hubs and tourist points. Regenta Central Hestia, Dahej offers 69 rooms to stay, which have been segregated into different categories such as Standard Rooms, Deluxe Rooms, Superior Rooms and Executive Suites. We also have Pinxx- our multi-cuisine coffee shop. With well-equipped banquet halls, we are adept at handling MICE events. We have a swimming pool and a gym for you to unwind. Spread over an area of 308 sq. ft., this room of our accommodation in Dahej features subtle interiors with pastel shades and dim lights. It consists of king-sized (or twin beds), complimentary high-speed internet, tea/coffee makers, work-stations, comfortable chair and so forth. Featuring a living space of 308 sq. ft., these rooms have been designed using modern interiors. 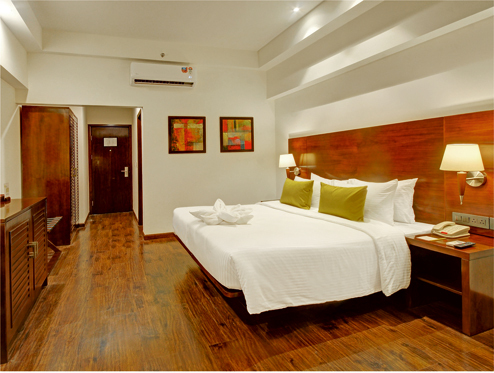 Wooden floors, bright lights and soothing interiors adorn the room. Some of the amenities found in the rooms include a comfortable bed with fresh linens, side tables next to the bed, wooden cupboards and cabinets. The Superior Rooms of Hotel Regenta Central Hestia, Dahej, consist of king/twin beds, wooden cabinets, side tables and closets. They feature soothing white interiors along with vibrant wall hangings and subtle lights. Some of the amenities that this room has include in-room telephones, complimentary Wi-Fi, tea/coffee maker and an electronic safe. These lawn facing rooms have an area of 308 sq. ft.
Having an expanse of 616 sq. ft., these rooms feature elegant interiors with pastel shades. It has numerous facilities such as tea/coffee maker, electronic safe, mini bar, comfortable bed, sofa set with table and so forth. If you are looking for a wedding hotel or a corporate hotel in Dahej, then Regenta Central Hestia is a suitable choice for you. Equipped with modern amenities, our hotel is suitable to orchestrate numerous large and small scale events.